b. ^ Fixed to the pound sterling (GBP). c. ^ The Falklands has been on FKST year-round since September 2010. The Falkland Islands (; Spanish: Islas Malvinas ) are an archipelago in the South Atlantic Ocean on the Patagonian Shelf. The principal islands are about 300 miles (480 km) east of South America's southern Patagonian coast, at a latitude of about 52°S. The archipelago, with an area of 4,700 square miles (12,000 km2), comprises East Falkland, West Falkland and 776 smaller islands. As a British overseas territory, the Falklands have internal self-governance, and the United Kingdom takes responsibility for their defence and foreign affairs. 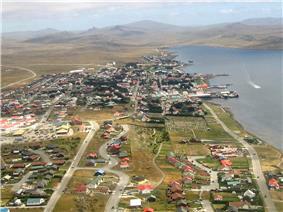 The islands' capital is Stanley on East Falkland. The population (2,932 inhabitants in 2012)[upper-alpha 1] primarily consists of native-born Falkland Islanders, the majority of British descent. Other ethnicities include French, Gibraltarian and Scandinavian. Immigration from the United Kingdom, the South Atlantic island of Saint Helena, and Chile has reversed a population decline. The predominant (and official) language is English. Under the British Nationality (Falkland Islands) Act 1983, Falkland Islanders are British citizens. The Falkland Islands take their name from the  The term "Falklands" is a standard abbreviation used to refer to the islands. The Spanish name for the archipelago, Islas Malvinas, derives from the French Îles Malouines — the name given to the islands by French explorer Louis-Antoine de Bougainville in 1764. Bougainville, who founded the islands' first settlement, named the area after the port of Saint-Malo (the point of departure for his ships and colonists). The port, located in the Brittany region of western France, was in turn named after St. Malo (or Maclou), the Christian evangelist who founded the city. Although Fuegians from Patagonia may have visited the Falkland Islands in prehistoric times, the islands were uninhabited at the time of their discovery by Europeans. Claims of discovery date back to the 16th century, but no consensus exists on whether these early explorers discovered the Falklands or other islands in the South Atlantic. [upper-alpha 2] The first recorded landing on the islands is attributed to English captain John Strong, who, en route to Peru's and Chile's littoral in 1690, discovered the Falkland Sound and noted the islands' water and game. The Falklands remained uninhabited until the 1764 establishment of Port Louis on East Falkland by French captain Louis Antoine de Bougainville, and the 1766 foundation of Port Egmont on Saunders Island by British captain John MacBride. [upper-alpha 3] Whether or not the settlements were aware of each other's existence is debated by historians. In 1766, France surrendered its claim on the Falklands to Spain, which renamed the French colony Puerto Soledad the following year. Problems began when Spain discovered and captured Port Egmont in 1770. War was narrowly avoided by its restitution to Britain in 1771. 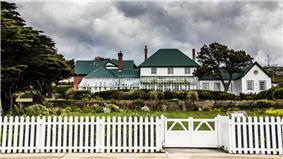 ^ The estimate excludes military personnel serving in the Falkland Islands and their dependents. ^ Roberto Laver argues this is likely the result of government policies which successfully reduced the number of non-British populations that at one point also inhabited the archipelago. Laver states that "naturalization ordinances" in the first decades of the British colony "show a wide variety of settlers from places in Europe, Northern, and Central America, and a couple from Argentina". 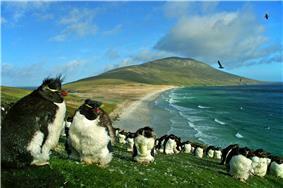 ^ a b c d e f "Falkland Islands Census 2012: Headline results" (PDF). Falkland Islands Government. 10 September 2012. Retrieved 19 December 2012. ^ a b c d e f "Falkland Islands (Islas Malvinas)". Central Intelligence Agency. Retrieved 10 July 2013. ^ "Falkland Islands will remain on summer time throughout 2011". ^ G. Hattersley-Smith (June 1983). "Fuegian Indians in the Falkland Islands". ^ White, Michael (2 February 2012). "Who first owned the Falkland Islands?". ^ a b Pascoe & Pepper 2008, pp. 541–544. ^ Laver 2001, pp. 122–123. ^ Norton-Taylor, Richard; Evans, Rob (28 June 2005). "Minister met junta envoy in Switzerland, official war history reveals"UK held secret talks to cede sovereignty: . The Guardian. Retrieved 12 June 2014. ^ Ruan, Juan Carlos; Macheme, Jill E. (August 2001). "Landmines in the Sand: The Falkland Islands". The Journal of ERW and Mine Action (James Madison University) 5 (2). ^ a b c d "The Falkland Islands Constitution Order 2008" (PDF). The Queen in Council. 5 November 2008. Retrieved 9 July 2013. 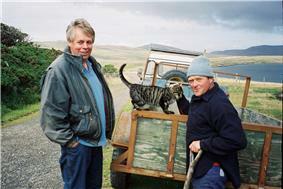 ^ "Falklands Governor Colin Roberts takes office next Tuesday 29 April". ^ "Keith Padgett, first Falklands' government CE recruited in the Islands". MercoPress. 7 March 2012. Retrieved 9 July 2013. ^ a b c d e Central Intelligence Agency 2011, "Falkland Islands (Malvinas) – Government". ^ """Falklands lawmakers: "The full time problem. MercoPress. 28 October 2013. Retrieved 1 July 2014. ^ EuropeAid (4 June 2014). "EU relations with Overseas Countries and Territories". European Commission. Retrieved 15 July 2014. ^ Michael Reisman (January 1983). 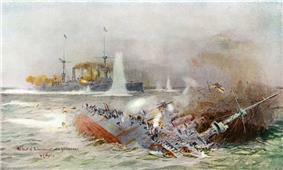 "The Struggle for The Falklands". Yale Law Journal (Faculty Scholarship Series) 93 (287): 306. Retrieved 23 October 2013. ^ a b Helen Otley; Grant Munro; Andrea Clausen; Becky Ingham (May 2008). "Falkland Islands State of the Environment Report 2008" (PDF). Environmental Planning Department Falkland Islands Government. Retrieved 25 March 2011. ^ Chura, Lindsay R. (June 30, 2015). "Pan-American Scientific Delegation Visit to the Falkland Islands". Science and Diplomacy. The ocean’s fecundity also draws globally important seabird populations to the archipelago; the Falkland Islands host some of the world’s largest albatross colonies and five penguin species. ^ a b c d Laver 2001, p. 9. ^ a b c "Falkland Islands Census Statistics, 2006" (PDF). Falkland Islands Government. Archived from the original (PDF) on 16 December 2010. Retrieved 4 June 2010. ^ "Falklands questions answered". BBC News. 4 June 2007. Retrieved 22 July 2013. ^ a b "Education". Falkland Islands Government. Retrieved 29 May 2014. Aldrich, Robert; Connell, John (1998). The Last Colonies. New York: Cambridge University Press. Avakov, Alexander (2013). Quality of Life, Balance of Powers, and Nuclear Weapons. New York: Algora Publishing. Balmaceda, Daniel (2011). Historias Inesperadas de la Historia Argentina (in Spanish). Buenos Aires: Editorial Sudamericana. Bell, Brian (2007). "Introduced Species". In Beau Riffenburgh. Encyclopedia of the Antarctic 1. New York: Routledge. Bernhardson, Wayne (2011). Patagonia: Including the Falkland Islands. Altona, Manitoba: Friesens. Bertram, Esther; Muir, Shona; Stonehouse, Bernard (2007). "Gateway Ports in the Development of Antarctic Tourism". Prospects for Polar Tourism. Oxon, England: CAB International. Blouet, Brian; Blouet, Olwyn (2009). Latin America and the Caribbean. Hoboken, New Jersey: John Wiley and Sons. Buckman, Robert (2012). Latin America 2012. Ranson, West Virginia: Stryker-Post Publications. Cahill, Kevin (2010). Who Owns the World: The Surprising Truth About Every Piece of Land on the Planet. New York: Grand Central Publishing. Calvert, Peter (2004). A Political and Economic Dictionary of Latin America. London: Europa Publications. Carafano, James Jay (2005). "Falkland/Malvinas Islands". In Will Kaufman; Heidi Slettedahl Macpherson. Britain and the Americas: Culture, Politics, and History. Santa Barbara, California: ABC–CLIO. Cawkell, Mary (2001). The History of the Falkland Islands. Oswestry, England: Anthony Nelson Ltd.
Day, David (2013). Antarctica: A Biography (Reprint ed.). Oxford, England: Oxford University Press. Dotan, Yossi (2010). Watercraft on World Coins: America and Asia, 1800–2008 2. Portland, Oregon: The Alpha Press. Dunmore, John (2005). Storms and Dreams. Auckland, New Zealand: Exisle Publishing Limited. Gibran, Daniel (1998). The Falklands War: Britain Versus the Past in the South Atlantic. Jefferson, North Carolina: McFarland & Company, Inc.
Goebel, Julius (1971). The Struggle for the Falkland Islands: A Study in Legal and Diplomatic History. Port Washington, New York: Kennikat Press. Guo, Rongxing (2007). Territorial Disputes and Resource Management. New York: Nova Science Publishers, Inc.
Gustafson, Lowell (1988). The Sovereignty Dispute Over the Falkland (Malvinas) Islands. New York: Oxford University Press. Haddelsey, Stephen; Carroll, Alan (2014). Operation Tabarin: Britain's Secret Wartime Expedition to Antarctica 1944–46. Stroud, England: The History Press. Headland, Robert (1989). Chronological List of Antarctic Expeditions and Related Historical Events. New York: Cambridge University Press. Heawood, Edward (2011). F. H. H. Guillemard, ed. A History of Geographical Discovery in the Seventeenth and Eighteenth Centuries (Reprint ed.). New York: Cambridge University Press. Hemmerle, Oliver Benjamin (2005). "Falkland Islands". In R. W. McColl. Encyclopedia of World Geography 1. New York: Golson Books, Ltd.
Hertslet, Lewis (1851). A Complete Collection of the Treaties and Conventions, and Reciprocal Regulations, At Present Subsisting Between Great Britain and Foreign Powers, and of the Laws, Decrees, and Orders in Council, Concerning the Same 8. London: Harrison and Son. Jones, Roger (2009). What's Who? A Dictionary of Things Named After People and the People They are Named After. Leicester, England: Matador. Jónsdóttir, Ingibjörg (2007). "Botany during the Swedish Antarctic Expedition 1901–1903". In Jorge Rabassa; Maria Laura Borla. Antarctic Peninsula and Tierra del Fuego. Leiden, Netherlands: Taylor & Francis. Klügel, Andreas (2009). "Atlantic Region". In Rosemary Gillespie; David Clague. Encyclopedia of Islands. Berkeley: University of California Press. Lansford, Tom (2012). Thomas Muller; Judith Isacoff; Tom Lansford, eds. Political Handbook of the World 2012. Los Angeles, California: CQ Press. Laver, Roberto (2001). The Falklands/Malvinas Case. The Hague: Martinus Nijhoff Publishers. Marley, David (2008). Wars of the Americas (2nd ed.). Santa Barbara, California: ABC-CLIO. Minahan, James (2013). Ethnic Groups of the Americas. Santa Barbara, California: ABC-CLIO. Peterson, Harold (1964). Argentina and the United States 1810–1960. New York: University Publishers Inc.
Prideaux, Bruce (2008). Michael Lück, ed. Falkland Islands. The Encyclopedia of Tourism and Recreation in Marine Environments (Oxon, England: CAB International). Reginald, Robert; Elliot, Jeffrey (1983). Tempest in a Teapot: The Falkland Islands War. Wheeling, Illinois: Whitehall Co.
Royle, Stephen (2001). A Geography of Islands: Small Island Insularity. New York: Routledge. Royle, Stephen (2006). Godfrey Baldacchino, ed. The Falkland Islands. Extreme Tourism: Lessons from the World's Cold Water Islands (Amsterdam: Elsevier). Sainato, Vincenzo (2010). "Falkland Islands". In Graeme Newman; Janet Stamatel; Hang-en Sung. Crime and Punishment around the World 2. Santa Barbara, California: ABC-CLIO. Segal, Gerald (1991). The World Affairs Companion. New York: Simon & Schuster/Touchstone. Sicker, Martin (2002). The Geopolitics of Security in the Americas. Westport, Connecticut: Praeger Publishers. Strange, Ian (1987). The Falkland Islands and Their Natural History. Newton Abbot, England: David & Charles. Thomas, David (1991). Wayne Smith, ed. The View from Whitehall. Toward Resolution? The Falklands/Malvinas Dispute (Boulder, Colorado: Lynne Rienner Publishers). Trewby, Mary (2002). Antarctica: An Encyclopedia from Abbott Ice Shelf to Zooplankton. Zepeda, Alexis (2005). "Argentina". In Will Kaufman; Heidi Slettedahl Macpherson. Britain and the Americas: Culture, Politics, and History. Santa Barbara, California: ABC–CLIO. Caviedes, César (1994). "Conflict Over The Falkland Islands: A Never-Ending Story?". Latin American Research Review 29 (2): 172–187. Darwin, Charles (1846). "On the Geology of the Falkland Islands" (PDF). Escudé , Carlos; Cisneros, Andrés, eds. (2000). Historia de las Relaciones Exteriores Argentinas. Buenos Aires, Argentina: GEL/Nuevohacer. Work developed and published under the auspices of the Argentine Council for International Relations (CARI). Greig, D. W. (1983). "Sovereignty and the Falkland Islands Crisis" (PDF). Australian Year Book of International Law 8: 20–70. Ivanov, L. L.; et al. (2003). The Future of the Falkland Islands and Its People. Sofia, Bulgaria: Manfred Wörner Foundation. Printed in Bulgaria by Double T Publishers. Falklands culture is "based on the British culture brought with the settlers from the British Isles", although it has been influenced by the cultures of Hispanic South America. Some terms and place names used by the islands' former Gaucho inhabitants are still applied in local speech. The Falklands' predominant and official language is English, with the foremost dialect being British English; nonetheless, inhabitants also speak Spanish and other languages. According to naturalist Will Wagstaff, "the Falkland Islands are a very social place, and stopping for a chat is a way of life". The Falkland Islands have a low population density. According to the 2012 census, the average daily population of the Falklands was 2,932, excluding military personnel serving in the archipelago and their dependents. [upper-alpha 13] A 2012 report counted 1,300 uniformed personnel and 50 British Ministry of Defence civil servants present in the Falklands. Stanley (with 2,121 residents) is the most-populous location on the archipelago, followed by Mount Pleasant (369 residents, primarily air-base contractors) and Camp (351 residents). The islands' age distribution is skewed towards working age (20–60). Males outnumber females (53 to 47 percent), and this discrepancy is most prominent in the 20–60 age group. In the 2006 census most islanders identified themselves as Christian (67.2 percent), followed by those who refused to answer or had no religious affiliation (31.5 percent). The remaining 1.3 percent (39 people) were adherents of other faiths. A significant population decline affected the archipelago in the twentieth century, with many young islanders moving overseas in search of education, a modern lifestyle, and better job opportunities, particularly to the British city of Southampton, which came to be nicknamed "Stanley north". In recent years, the island's population decline has steadied, thanks to immigrants from the United Kingdom, Saint Helena, and Chile. In the 2012 census, a majority of residents listed their nationality as Falkland Islander (59 percent), followed by British (29 percent), Saint Helenian (9.8 percent), and Chilean (5.4 percent). A small number of Argentines also live on the islands. The Falkland Islands are a homogeneous society, with the majority of inhabitants descended from Scottish and Welsh immigrants who settled the territory in 1833. [upper-alpha 12] The 2006 census listed some Falklands residents as descendants of French, Gibraltarians and Scandinavians. That census indicated that one-third of residents were born on the archipelago, with foreign-born residents assimilated into local culture. The legal term for the right of residence is "belonging to the islands". The British Nationality Act of 1983 gave British citizenship to Falkland Islanders. Falkland Islanders are predominantly of Welsh and Scottish ancestry. The primary sector of the economy accounts for most of the Falkland Islands' gross domestic product, with the fishing industry alone contributing between 50% and 60% of annual GDP; agriculture also contributes significantly to GDP and employs about a tenth of the population. A little over a quarter of the workforce serves the Falkland Islands government, making it the archipelago's largest employer. Tourism, part of the service economy, has been spurred by increased interest in Antarctic exploration and the creation of direct air links with the United Kingdom and South America. Tourists, mostly cruise ship passengers, are attracted by the archipelago's wildlife and environment, as well as activities such as fishing and wreck diving; the majority are based in accommodation found in Stanley. The islands' major exports include wool, hides, venison, fish and squid; its main imports include fuel, building materials and clothing. The port city of Stanley has regained the islands' economic focus, with an increase in population as workers migrate from Camp. Fear of dependence on fishing licences and threats from overfishing, illegal fishing and fish market price fluctuations have increased interest on oil drilling as an alternative source of revenue; exploration efforts have yet to find "exploitable reserves". Development projects in education and sports have been funded by the Falklands government, without aid from the United Kingdom. Economic development was advanced by ship resupplying and sheep farming for high-quality wool. During the 1980s, although synthetic fibres and ranch underinvestment hurt the sheep-farming sector, the government established a major revenue stream with the establishment of an exclusive economic zone and the sale of fishing licenses to "anybody wishing to fish within this zone". Since the end of the Falklands War in 1982, the islands' economic activity has increasingly focused on oil field exploration and tourism. Virtually the entire land area of the islands is used as pasture for sheep. Introduced species include reindeer, hares, rabbits, Patagonian foxes, brown rats and cats. The detrimental impact several of these species have caused to native flora and fauna has led authorities to attempt to contain, remove or exterminate invasive species such as foxes, rabbits and rats. Endemic land animals have been the most affected by introduced species. The extent of human impact on the Falklands is unclear, since there is little long-term data on habitat change. The islands are frequented by marine mammals, such as the southern elephant seal and the South American fur seal, and various types of cetaceans; offshore islands house the rare striated caracara. The Falklands are also home to five different penguin species and a few of the largest albatross colonies on the planet. Endemic fish around the islands are primarily from the genus Galaxias. The Falklands are treeless and have a wind-resistant vegetation predominantly composed of a variety of dwarf shrubs. The climate of the islands is cold, windy and humid maritime. Variability of daily weather is typical throughout the archipelago. Rainfall is common over half of the year, averaging 610 millimetres (24 in) in Stanley, and sporadic light snowfall occurs nearly all year. The temperature is generally between 21.1 and −11.1 °C (70.0 and 12.0 °F) in Stanley, but can vary to 9 °C (48 °F) early in the year and −1 °C (30 °F) in July. Strong westerly winds and cloudy skies are common. Although numerous storms are recorded each month, conditions are normally calm. The Falklands are situated approximately at latitude 51°40′ – 53°00′ S and longitude 57°40′ – 62°00′ W. The archipelago's two main islands are separated by the Falkland Sound, and its deep coastal indentations form natural harbours. East Falkland houses Stanley (the capital and largest settlement), the UK military base at RAF Mount Pleasant, and the archipelago's highest point: Mount Usborne, at 2,313 feet (705 m). Outside of these significant settlements is the area colloquially known as "Camp", which is derived from the Spanish term for countryside (Campo). In 2009, British prime minister Gordon Brown had a meeting with Argentine president Cristina Fernández de Kirchner, and said that there would be no further talks over the sovereignty of the Falklands. In March 2013, the Falkland Islands held a referendum on its political status, with 99.8 percent of voters favoured remaining under British rule. Argentina does not recognise the Falkland Islands as a partner in negotiations; consequently, it dismissed the Falkland Islands' sovereignty referendum. The United Kingdom and Argentina both claim the Falkland Islands. The UK's position is that the Falklanders have not indicated a desire for change, and that there are no pending issues to resolve concerning the islands. The UK bases its position on its continuous administration of the islands since 1833 (except for 1982) and the islanders' "right to self-determination as set out in the UN Charter". Argentine policy maintains that Falkland Islanders do not have a right to self-determination, claiming that in 1833 the UK expelled Argentine authorities (and settlers) from the Falklands with a threat of "greater force" and, afterwards, barred Argentines from resettling the islands. Argentina posits that it acquired the Falklands from Spain when it achieved independence in 1816, and that the UK illegally occupied them in 1833. Due to its link to the UK, the Falklands are part of the overseas countries and territories of the European Union. The islands' judicial system, overseen by the Foreign and Commonwealth Office, is largely based on English law, and the constitution binds the territory to the principles of the European Convention on Human Rights. Residents have the right of appeal to the European Court of Human Rights and the Privy Council. Law enforcement is the responsibility of the Royal Falkland Islands Police (RFIP), and military defence of the islands is provided by the United Kingdom. A British military garrison is stationed on the islands, and the Falkland Islands government funds an additional company-sized light infantry Falkland Islands Defence Force. The territorial waters of the Falklands extend to 200 nautical miles (370 km) from its coastal baselines, based on the United Nations Convention on the Law of the Sea; this border overlaps with the maritime boundary of Argentina. The Falkland Islands are a self-governing British Overseas Territory. Under the 2009 Constitution, the islands have full internal self-government; the UK is responsible for foreign affairs, retaining the power "to protect UK interests and to ensure the overall good governance of the territory". The Monarch of the United Kingdom is the head of state, and executive authority is exercised on the monarch's behalf by the Governor, who in turn appoints the islands' Chief Executive on the advice of members of the Legislative Assembly. Both the Governor and Chief Executive serve as the head of government. Governor Colin Roberts was appointed in April 2014; Chief Executive Keith Padgett was appointed in March 2012. The UK minister responsible for the Falkland Islands since 2012, Hugo Swire, administers British foreign policy regarding the islands. Based on Lord Shackleton's recommendations, the Falklands diversified from a sheep-based monoculture into an economy of tourism and, with the establishment of the Falklands Exclusive Economic Zone, fisheries. [upper-alpha 11] The road network was also made more extensive, and the construction of RAF Mount Pleasant allowed access to long haul flights. Oil exploration has also begun, with indications of possible commercially exploitable deposits in the Falklands basin. Landmine clearance work restarted in 2009, in accordance with the UK's obligations under the Ottawa Treaty, and Sapper Hill Corral was cleared of mines in 2012, allowing access to an important historical landmark for the first time in 30 years. Argentina and the UK re-established diplomatic relations in 1990; relations have since deteriorated as neither has agreed on the terms of future sovereignty discussions. Disputes between the governments have led "some analysts [to] predict a growing conflict of interest between Argentina and Great Britain ... because of the recent expansion of the fishing industry in the waters surrounding the Falklands". Stanley, as Port Jackson was soon renamed, officially became the seat of government in 1845. Early in its history, Stanley had a negative reputation due to cargo-shipping losses; only in emergencies would ships rounding Cape Horn stop at the port. Nevertheless, the Falklands' geographic location proved ideal for ship repairs and the "Wrecking Trade", the business of selling and buying shipwrecks and their cargoes. Aside from this trade, commercial interest in the archipelago was minimal due to the low-value hides of the feral cattle roaming the pastures. Economic growth began only after the Falkland Islands Company, which bought out Lafone's failing enterprise in 1851,[upper-alpha 9] successfully introduced Cheviot sheep for wool farming, spurring other farms to follow suit. The high cost of importing materials, combined with the shortage of labour and consequent high wages, meant the ship repair trade became uncompetitive. After 1870, it declined as the replacement of sail ships by steamships was accelerated by the low cost of coal in South America; by 1914, with the opening of the Panama Canal, the trade effectively ended. In 1881, the Falkland Islands became financially independent of Britain. For more than a century, the Falkland Islands Company dominated the trade and employment of the archipelago; in addition, it owned most housing in Stanley, which greatly benefited from the wool trade with the UK. Buenos Aires attempted to retain influence over the settlement by installing a garrison, but a mutiny in 1832 was followed the next year by the arrival of British forces who reasserted Britain's rule. The Argentine Confederation (headed by Buenos Aires Governor Juan Manuel de Rosas) protested Britain's actions,[upper-alpha 7] and Argentine governments have continued since then to register official protests against Britain. [upper-alpha 8] The British troops departed after completing their mission, leaving the area "a kind of no man's land". Vernet's deputy, the Scotsman Matthew Brisbane, returned to the islands that year to restore the business, but his efforts ended after, amid unrest at Port Louis, gaucho Antonio Rivero led a group of "malcontents" to murder Brisbane and the settlement's senior leaders; survivors hid in a cave on a nearby island until the British returned and restored order. In 1840, the Falklands became a Crown colony, and Scottish settlers subsequently established an official pastoral community. Four years later, nearly everyone relocated to Port Jackson, considered a better location for government, and merchant Samuel Lafone began a venture to encourage British colonisation. Thereafter, the archipelago was visited only by fishing ships; its political status was undisputed until 1820, when Colonel David Jewett, an American privateer working for the United Provinces of the Río de la Plata, informed anchored ships about Buenos Aires' 1816 claim to Spain's territories in the South Atlantic. [upper-alpha 4] Since the islands had no permanent inhabitants, in 1823 Buenos Aires granted German-born merchant Luis Vernet permission to conduct fishing activities and exploit feral cattle in the archipelago. [upper-alpha 5] Vernet settled at the ruins of Puerto Soledad in 1826, and accumulated resources on the islands until the venture was secure enough to bring settlers and form a permanent colony. Buenos Aires named Vernet military and civil commander of the islands in 1829, and he attempted to regulate sealing to stop the activities of foreign whalers and sealers. 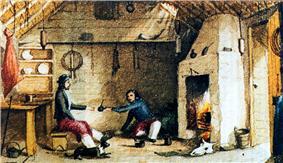 Vernet's venture lasted until a dispute over fishing and hunting rights led to a raid by the American warship USS Lexington in 1831,[upper-alpha 6] when United States Navy commander Silas Duncan "declared the island government at an end".